Hambijon: Commanders! Frontline Episode 3 is now available! FRONTLINE 2019: EPISODE 3 STARTS: Monday, April 15 at 04:00 PT | 06:00 CT | 07:00 ET ENDS: Monday, April 22 at 01:00 PT | 03:00 CT | 04:00 ET CEASE-FIRE: Daily at 01:00-04:00 PT | 03:00-06:00 CT | 04:00-07:00 ET We have another week of climbing the prestigious ladder to lots of rewards and tanks! As a reminder, the tanks up for grabs is as follows:STA-2 WZ-111 Emil 1951 A secret Tier IX vehicle "How do I access Frontline?" 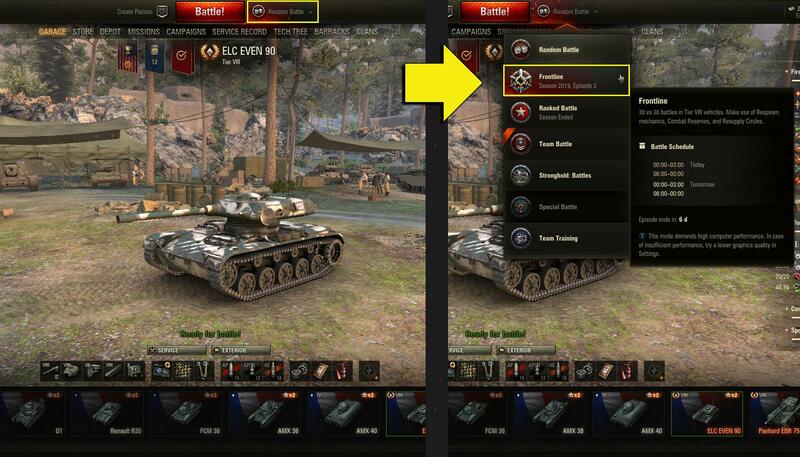 Since we've been asked this question a few times, we made a handy little image for those who don't know: To get the full list of details about Frontline and the offers available click the links below:Frontline: Episode 3 Frontline Regulations Tier VIII tank offers Also, Episode 4 will start May 13th at 04:00 PT | 06:00 CT | 07:00 ET on NA servers, until May 20 at 01:00 PT | 03:00 CT | 04:00 ET. GLHF!